In the 8 years that I’ve been working in gardens in Saratoga and Lake George, many of my clients have requested help with lawn care. 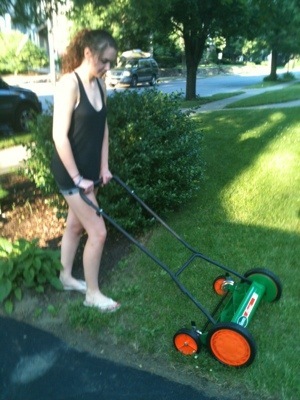 My interest in lawns is beyond non-existant. I actively encourage everyone to replace lawn space with gardens, or at least plant maintenance free turf like Creeping Thyme or Sedum. People continue to ask for help with their lawns none-the-less. So, this year our intern Tori will be available for environmental and ecologically friendly mowing in the Saratoga and Lake George gardening region, using a “Reel Mower”- which is, as shown in the photo above, not powered by gas or electricity- simply rotating sharp blades that work on human muscle and elbow grease. Feel free to contact us to schedule an appointment for mowing. Tough weeding spots- between sidewalk cracks and in stonepaths can be treated with White Vinegar instead of Round-Up. In fact, Round-Up should really halt production and shut their doors as White Vinegar does all the same tasks, for cheaper cost and in a non-toxic way.